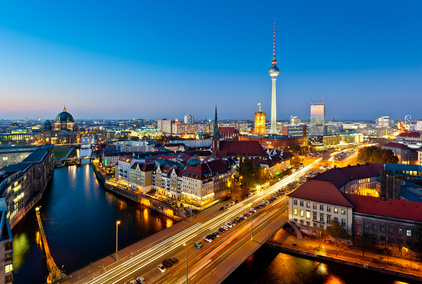 Monarch Air Group provides private air charter in Berlin, Germany. Our clients benefit from top-notch service, unrelenting dedication to safety, wide selection of aircraft, and years of experience in chartering private jets. To obtain a free quote, please use our online quoting tool provided below, or call toll free 1-877-281-3051. Monarch Air Group provides private jet charter flights to and from Berlin, Germany. Located in northeastern Germany, Berlin is the capital city and the largest city of Germany. It is politics, media, culture, and science center in the Europe region. For the last 100 years, Berlin has undergone great changes. Most of the city’s buildings and streets have been restored, rebuilt or rejuvenated including Unter den Linden, the Museumsinsel, the Tiergarten Park, and German Parliament Building. Nowadays Berlin is a prosperous, modern and amazing place for business and leisure travelers alike. The most popular tourist attractions are the Europa Center on the Zoologischer Garten, Reichstag, the Kollhoff Tower on the Potsdamer Platz, the Hamburger Bahnhof, the Brandenburg Gate, the Fernsehturm on the Alexanderplatz, and the Siegessaule (Victory Column) in the Tiergarten area. There are about 50 theaters and 150 museums, some of them are the Neues Museum, the Altes Museum, the Alte Nationalgalerie, the Jewish Museum, the Deutsches Theater, the Berlin Philharmonic Orchestra, and the Berlin State Opera. Berlin is home to numerous festivals and events around the year including the Christopher Street Day gay and lesbian parade in June, and the Jazz Berlin Fest in November.